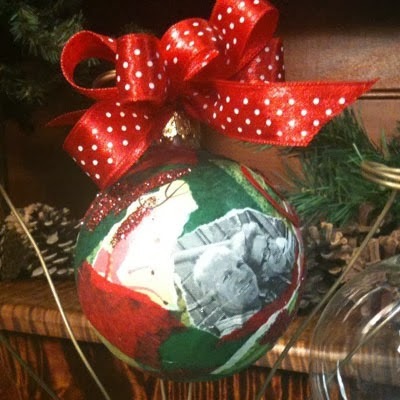 Tear out photos, designs and words to decoupage a holiday ornament. Make sure to select some paper in holiday colors for your ornament. Cut or tear words or special designs from papers you wish to be predominate on ornament. Cut or tear additional pieces until there are enough to cover ornament. If paper is torn it will leave a ragged white edge, which will make it look more like a collage. Cover work surface with paper towels. Shake bottle of Collage Pauge well. Squeeze a puddle onto foil. Working in a small area at a time, quickly brush Collage Pauge onto ornament and onto back of a strip of paper. Smooth paper onto wet glue on ornament. Brush a coat of Collage Pauge over paper. Dip fingers into water. Smooth out any air bubbles, starting at center and working outward in a circle. Repeat procedure until ornament is covered. Repeat procedure to add words or special designs. Apply a coat of Collage Pauge. Let dry, we recommend hang dry. Embellish with glue, sprinkle with glitter.